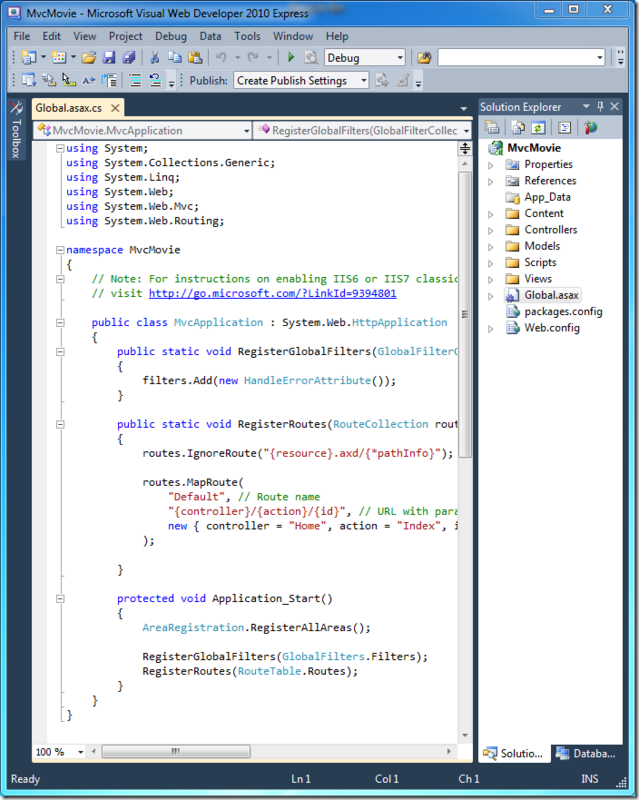 A Visual Web Developer project with C# source code is available to accompany this topic. Download the C# version. If you prefer Visual Basic, switch to the Visual Basic version of this tutorial. In this section you'll make some changes to the model classes and learn how you can update the database schema to match the model changes. Recompile the application using the Debug >Build Movie menu command. 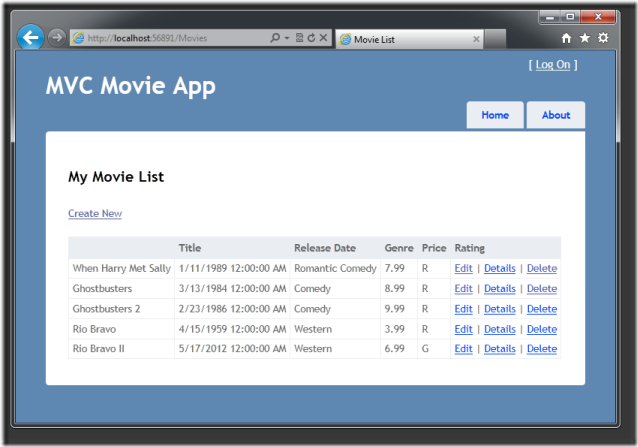 Now that you've updated the Model class, you also need to update the \Views\Movies\Index.cshtml and \Views\Movies\Create.cshtml view templates in order to support the new Rating property. 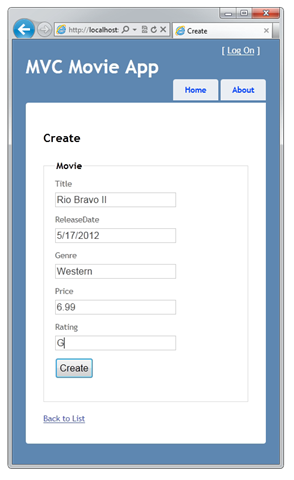 Next, open the \Views\Movies\Create.cshtml file and add the following markup near the end of the form. 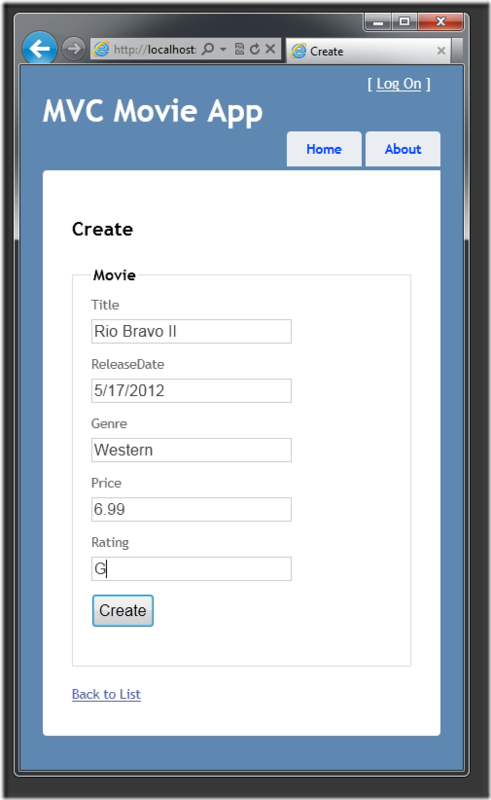 This renders a text box so that you can specify a rating when a new movie is created. You've now updated the application code to support the new Rating property. By default, when you use Entity Framework Code First to automatically create a database, as you did earlier in this tutorial, Code First adds a table to the database to help track whether the schema of the database is in sync with the model classes it was generated from. If they aren't in sync, the Entity Framework throws an error. This makes it easier to track down issues at development time that you might otherwise only find (by obscure errors) at run time. The sync-checking feature is what causes the error message to be displayed that you just saw. Have the Entity Framework automatically drop and re-create the database based on the new model class schema. This approach is very convenient when doing active development on a test database, because it allows you to quickly evolve the model and database schema together. The downside, though, is that you lose existing data in the database — so you don't want to use this approach on a production database! Explicitly modify the schema of the existing database so that it matches the model classes. The advantage of this approach is that you keep your data. You can make this change either manually or by creating a database change script. For this tutorial, we'll use the first approach — you'll have the Entity Framework Code First automatically re-create the database anytime the model changes. Let's update the application so that Code First automatically drops and re-creates the database anytime you change the model for the application. Warning You should enable this approach of automatically dropping and re-creating the database only when you're using a development or test database, and never on a production database that contains real data. Using it on a production server can lead to data loss. 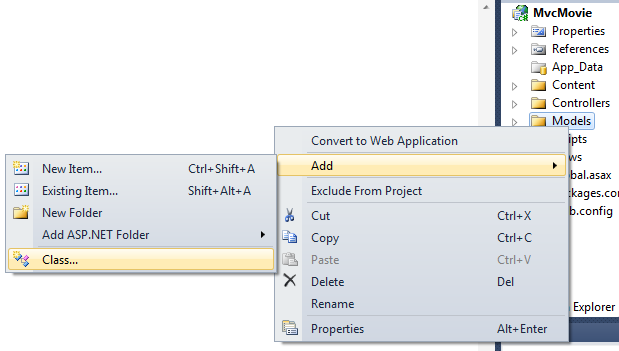 In Solution Explorer, right click the Models folder, select Add, and then select Class. 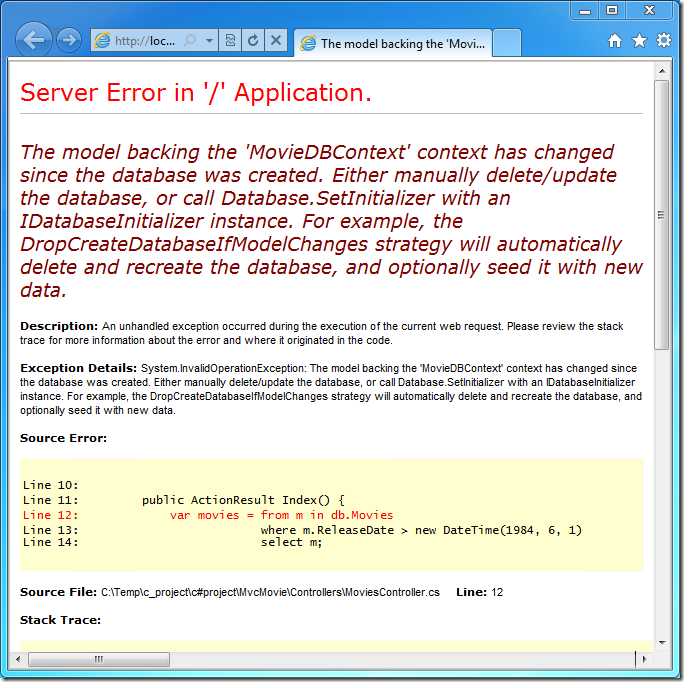 The MovieInitializer class specifies that the database used by the model should be dropped and automatically re-created if the model classes ever change. The code includes a Seed method to specify some default data to automatically add to the database any time it's created (or re-created). This provides a useful way to populate the database with some sample data, without requiring you to manually populate it each time you make a model change. Now that you've defined the MovieInitializer class, you'll want to wire it up so that each time the application runs, it checks whether the model classes are different from the schema in the database. If they are, you can run the initializer to re-create the database to match the model and then populate the database with the sample data. The Global.asax file contains the class that defines the entire application for the project, and contains an Application_Start event handler that runs when the application first starts. 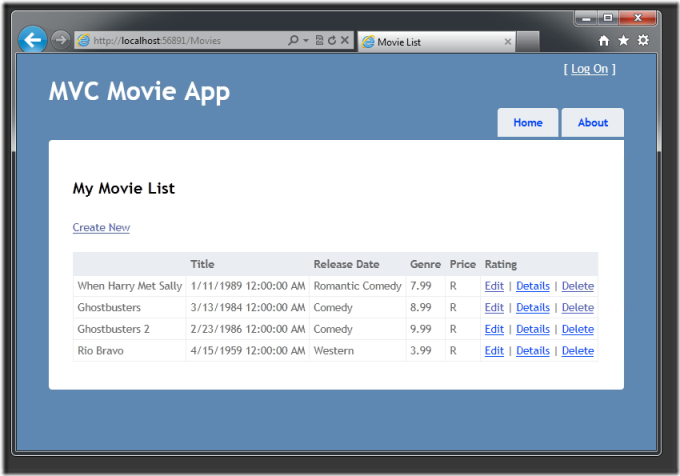 The Database.SetInitializer statement you just added indicates that the database used by the MovieDBContext instance should be automatically deleted and re-created if the schema and the database don't match. And as you saw, it will also populate the database with the sample data that's specified in the MovieInitializer class. Click the Create New link to add a new movie. Note that you can add a rating. In this section you saw how you can modify model objects and keep the database in sync with the changes. You also learned a way to populate a newly created database with sample data so you can try out scenarios. Next, let's look at how you can add richer validation logic to the model classes and enable some business rules to be enforced.